Recommended to arrive by morning flight and then picked up by guide and driver. Drive about 7 hours to Ijen Crater Area. Check in. Pick up at 00.00 and driving about 2 hours to Paltuding. From Paltuding then trek about 3.5 km or 1 hour to Ijen Crater Rim and and another 1 hour descend to watch Ijen Blue Fire Phenomenon. Afterwards expecting sunrise and enjoy Ijen Crater and take picture. About 06.00 descend to Paltuding and drive back to hotel and drive about 5 hours to Mount Bromo Area. Check in hotel. Pick up at 03.00 by 4WD vehicle and enjoy the bumping offroad trip to Mt Penanjakan. 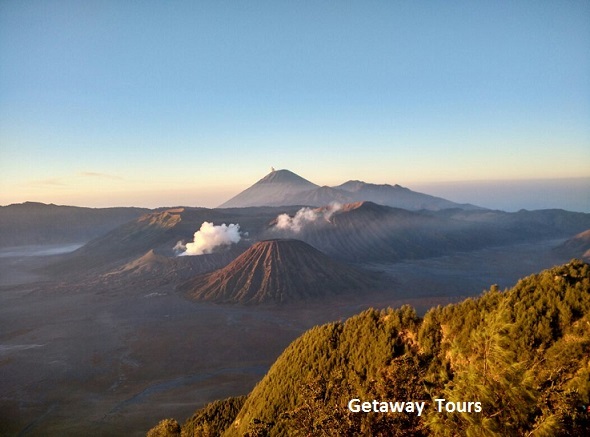 Walk about 10 minutes from Jeep Parking Area to Mt Penanjakan view point where you can see the famous magnificent Bromo sunrise. Afterwards return to jeep and then drive to sea of sand and then soft trek about 30 minutes to the peak of Mt Bromo. From up the Bromo Crater Rim you can see the active Bromo Crater, Hindu Temple , Caldera and mountainous view in the vicinity, including Mt Semeru, the highest peak in Java. Return to Jeep and drive to local restaurant to have breakfast. Visit Madakaripura Waterfall which can be reached by 5 minutes on motorbike and 45 minutes walk along creek. Drive to an off the beaten path destination, Seloliman, located on the slope of Mount Penanggungan. If still have time and weather is good, and then enjoy sunset from rice terrace nestles nearby the hotel. After breakfast and then check out. Visit Jalatunda Spring Temple to refresh. Jalatunda Spring Temple was built in the period of King Udayana from Bali, in the 9th Century, the water is known as one of the best quality in the world and believed to have a healing virtue. Drive to Belahan Temple, another spring temple from the 10th Century located under lush forest, with beautiful statues of two goddesses. Drive to Surabaya and cross Suramadu Bridge and cross to Madura Island. Visit Jaddih Hill, a limestone hill which was mined and now a tourist attraction with blue man-made lake. Check in hotel in Surabaya. After breakfast, enjoy city tour (House of Sampoerna Museum, Heroes Monument, Surabaya Statue, Surabaya City Hall) and Shopping. Drop you to airport. End of service.